Inflammation is mediated by a variety of soluble factors, including a group of secreted polypeptides known as cytokines. The anti-inflammatory cytokines are a series of immune regulatory molecules that control the pro inflammatory cytokine response. Cytokines act in concert with specific cytokine inhibitors and soluble cytokine receptors to regulate the human immune response. The aim of the present study is to probe the anti-inflammatory potential of the crude extract and the bioactive metabolite isolated from marine bacteria Streptomyces sp. on key inflammatory mediators like tumor necrosis factor-α and interleukin-6. 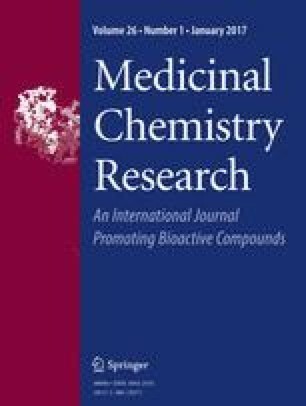 Here, we isolated ten known pyrazine-1,4-dione substituted cyclic dipeptide by semi-preparative HPLC and studied their anti-inflammatory activities against tumor necrosis factor-α and interleukin-6. Compound 3, 4, 5, 7 and 8 showed good inhibition of the both the cytokines in lipopolysaccharide-stimulated macrophages. The study reveal that compound 7 was to be specific inhibitor for tumor necrosis factor-α which efficiently inhibited tumor necrosis factor-α release in a dose-dependent manner and decreased lipopolysaccharide induced tumor necrosis factor-α production in human peripheral blood mononuclear cells in both the in vitro and in vivo experiments. The online version of this article (doi: 10.1007/s00044-016-1730-8) contains supplementary material, which is available to authorized users. The authors are grateful to the University grant commission (UGC-New Delhi) and CSIR for providing financial support having the Grant No. ITR-0001 for the work of YN, and SM. YK, SG and VK acknowledge AcSIR for their enrolment in Ph. D program. VK also acknowledge DST for INSPIRE Fellowship. We are also thankful to Deeαpika Singh for recording the NMR experiments.